Massachusetts is a state in the northeastern United States in the New England region. 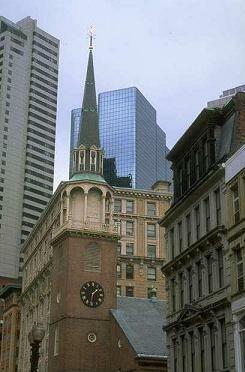 The state has the largest population of any of the New England states, and contains the city of Boston. Important education institutions in Massachusetts include Boston University (in Boston), Harvard University (in Cambridge), Massachusetts Institute of Technology (in Cambridge), Northeastern University (in Boston) and Suffolk University (in Boston). Professional sports franchises in Massachusetts include the Boston Bruins (ice hockey in the NHL) in Boston, the Boston Celtics (National Basketball Association) in Boston, the Boston Red Sox (Major League Baseball) in Boston, Brockton Rox (Can-Am League baseball) in Brockton, the Lowell Devils (ice hockey in the AHL) in Lowell, the Lowell Spinners (New York-Penn League baseball) in Lowell, the New England Patriots (American football in the NFL) in Foxborough, the New England Revolution (Major League Soccer) in Foxborough, North Shore Spirit (Can-Am League baseball) in Lynn, the Springfield Falcons (ice hockey in the AHL) in Springfield, the Worcester Sharks (ice hockey in the AHL) in Worcester, and the Worcester Tornadoes (Can-Am League baseball) in Worcester. Some of the leading companies headquartered in Massachusetts are 3Com (in Marlborough), Novell (in Waltham), Akami (in Cambridge), Bain & Company (in Boston), Bain Capital (in Boston), EMC Corporation (in Hopkinton), Gilette (in Boston), Liberty Mutual Insurance Group (in Boston), Massachusetts Mutual Life Insurance (in Springfield), New Balance (in Boston), Raytheon (in Waltham), Staples Inc. (in Framingham), The Boston Consulting Group (in Boston) and TJX (in Framingham). The principal airport serving Massachusetts is Logan International which is in Boston. Places of interest in Massachusetts. Guide books containing travel information for Massachusetts. Details of skiing in Massachusetts. Towns and cities in Massachusetts.